You guys, when it comes right down to it, I’m an OCD hypochondriac. I’m pretty sure I’m singlehandedly driving Web MD’s traffic right now. In between stuffing my face with green curry lentils, I’ve been known to do investigative work on Web Md and make extreme self-diagnoses. I also do this in between bites of sandwiches. 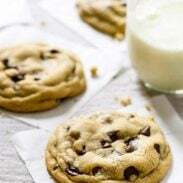 And chocolate chip malt cookies. It’s ridiculous, and I know it’s ridiculous. I have a hard time not being ridiculous on this one. Because I definitely have at least 5 types of cancer. This week, I read an article about inflammation and how processed foods have slowly been disease-ing my body for the last 20 some years. And of course, I read it on the way to meet friends for greasy inflammatory appetizers. Of course. My hypochondraic self panicked as I heard my other self ordering the waffle fries. Omega 6. Cancer. Heart disease. Certain death. But hot, salty, fried perfection! Stop, order, no, waaaait! I thought I had already kinda done the lentil thing this month. What kind of person posts two recipes for lentils within a few days of each other? An OCD hypochondriac French fry lover looking for a second chance at life? I think so. In honor of my new quest for anti-inflammatory foods, and in honor of myself still planning to eat French fries until kingdom come, I’m so pumped to share with you this recipe. It’s a deeeelicious way to treat your body right. Kinda like fries, but not. Hello saucy lentils, curry paste, a punch of spice, coconut creaminess, and fresh spinach. Hello and nice to meet you, lentil lover. These easy coconut green curry lentils are so delicious and so healthy! Loaded with spices, coconut milk, spinach, and lentils. Place lentils, bulgur, 2 cups water, curry paste, and turmeric in a medium saucepan. Bring to a boil and simmer for 15-20 minutes or until lentils are mostly cooked. Add the remaining 1/2 cup water during cook time if lentils and bulgur have absorbed all the water. You want to cook it until there is no liquid remaining. Turn the heat to medium or low, if it’s not already. Keeping the saucepan on the heat, stir in the tomato paste. Mixture should thicken slightly. Add butter, garlic, and garam masala; stir to combine until butter is melted. Add coconut milk and simmer for another 5-10 minutes or until thick and creamy. Remove from heat and stir in ginger and spinach until barely wilted. You can also serve this with fresh spinach, adding it just before serving. This can be vegan if you omit the butter and yogurt. Thanks to KitchenLab for inspiring this recipe! Alright, speak out, friends. What’s your take on the anti-inflammatory stuff? And if you have any great anti-inflammatory recipe ideas, I’d love to hear them. Cause all I’m seeing right now is LENTILLLLLLLLS. Love this! I am the biggest fan of green curry and your recipe is fabulous! Haha, I definitely have to step away from the medical internet sites because it just sends me into a spiral of all the things I should be doing but aren’t and then I just get overwhelmed and have to eat a cookie. Much better to just have a delicious bowl of lentils and feel virtuous without torturing myself! Eat a cookie. That’s what I’ll try. Green Curry, how we love thee. I wish I knew a way to block myself from googling medical issues. It always just results in me thinking I’m on the verge of death. And usually, it’s in the middle of the night so I get to freak out about it for the next 8 hours instead of sleeping. I know nothing about anti-inflammatory foods but I do know this looks dah-licious! Gah. We need to create a support group. Like, now. Totally love it because ever since I tried your other recipe, I’m like – wow, I love lentils! I had no idea. So I’ve been pinning lentil recipes like crazy!! They don’t seem all that lovable until you have some really good ones… and then you realize that they are SO yummy. 🙂 Glad you’re catching lentil fever with me! HA! Advil and sweet red wine. I’ll take a double order. Mmmmm…lentils and curry go so well together. This looks perfect! OMG, I need this NOW! I try to eat lentils on a regular basis…this recipe would make that easier! Lentils get boring fast. We gotta spice it up a notch, right!? Oh my heavens, this looks incredible! I have no issue with multiple lentil recipes. Especially one that includes curry. TOTES. I’m a lentil lovah, to the max. You’re rubbing off on me, lentil friend. Trying these tonight! I have bunches of lentils lying around that I’m not sure what to do with. Love curry too. This looks incredible. I love lentil dishes and I adore curry. Love the addition of coconut milk. I HAVE to make this this week 🙂 Thanks for sharing! Enjoy your day. Yummy! I’m all for creamy curry lentils. They sound delicious! I like the bulgur mixed in there too. As for self diagnosing, I totally need to stop that too, haha. I don’t know too much about the “anti-inflammatory” stuff except that it means more veggies and less carbs and I know I feel better when I eat like that. Ooh, and ginger is very anti-inflammatory. I loooove fresh ginger. Looks delish!! We love lentils too – this inspires me to try a curry again! You guys OWN lentils. Seriously. 🙂 I’m sure you’ll have some awesome lentil fusion dishes when you come back from Cambodia! These look gorgeous…all of a sudden I know what to do with the stray random bits of lentils in my cupboard. That is totally me. I finished off two bags that each had just a little bit left for this recipe! PS. I spent a long time perusing your site today and I’m loving the changes you’ve made. Beautiful! I’m the same bad googling way! I’ve officially put myself on a no WebMD diet!! I feel like thats worse for me than butter and cream!! Just made this with a few substitutions – a can of drained fire-roasted tomatoes instead of tomato paste, and no bulgar since I don’t have it on hand – and it is FANTASTIC. Thanks so much for posting! You’re a crack up! I frequent web MD in a somewhat compulsive and irrational way. I actually looked up the nutrition facts on lentils today (I had lentil soup although your lentil curry recipe would have been awesome too!) Tons of fiber and complex slow burning carbs – great meal! I like that you made a green curry out of them too to change things up! Those looks so delicious. I am good friends with Web MD myself. You go girl! Come visit this week. We have some great Irish treats to share. Well your two lovely back-to-back lentil recipes are exactly what drew me from Tasty Kitchen to your site! I absolutely love lentils, and I HAVE to try preparing them this way. 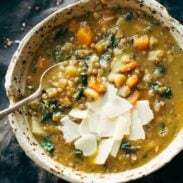 =) Question–do you use regular brown lentils for this recipe? Yup! 🙂 Glad you’re liking the lentils! Girl, I might give you a run for your money with WebMD. 🙂 Seriously, I sort of wished the internet didn’t exist…but then I couldn’t check out this weird skin thing…oh nevermind. Looks like, yet again, another yummy recipe!! How do you get the lentils to cook in only 15 minutes? Just boiled em and after 15 they start to get tender! If you want them to be softer you can always boil them longer. There are two sizes of lentils, so check whether you have the small or large ones. Also the freshness of the lentils will make a huge difference. The older they are the longer they take to cook (all other things being equal). Love lentils! What a great dish! This looks SO fabulous! We’ve been on a big lentil kick lately. Yum! Just made this and it is delicious! I added in some ginger, lime juice, and green onions right at the end as well to cut some of the richness. Great idea with the green onions and lime juice! I love that!